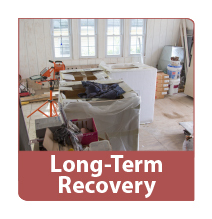 Long-Term Recovery Teams (LRTs) are deployed in the recovery phase of a disaster. Their role is to begin the repair/rebuild process for disaster survivors. LTR teams follow many of the same guidelines as Early Response Teams. However, within the long-term recovery process the need for skilled persons (electricians, plumbers, sheet rockers, finish-carpenters, etc.) becomes more critical. This is in addition to general-skilled, support persons, and helpers. A well-balanced team should have a combination of all skill levels and experiences. While there are no formal training requirements for LTR team members, all participants need to have a background check and be approved for deployment. Skill-specific training events will be held periodically in different locations throughout the Conference. Please see the “Trainings” link for dates and locations. Please contact Tom Vencuss at tvencuss@nyac.com with any questions.